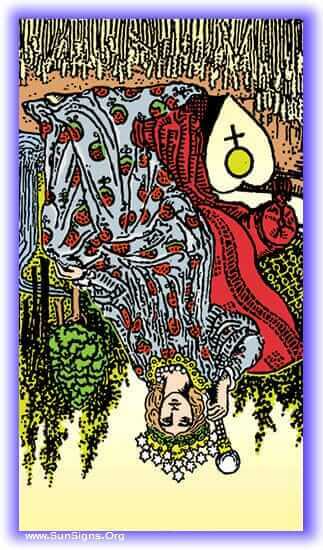 The tone of the meditation on the Empress tarot card in reversed position is futility, dormancy, and obstacles. Keep that in mind when you select the music. Once you have the environment conducive to an uninterrupted meditation, place the card in front of you, light the incense and candle, and take a few breaths to center. Rest your eyes upon this Major Arcana card, taking in its imagery without truly attempting to ‘see’ it. You may very well feel the card resisting your attempts to begin your meditation, this is normal, accept the sense of futility and flow within. Within you will find a world in an unnatural winter, everything is in stasis, all things are lost. You may see the bodies of animals that had sought shelter, but were lost in the winter snows. You will see the failed attempts at fires started, and a myriad of half-built constructions, their completion forever delayed. Everywhere you will see the results of poor planning, of terrible luck, and failed ambitions. This is the Empress Tyrants realm. As you travel throughout you will find her, no longer in her chamber, but actively seeking out the work of her people. You will see them driven before her lash as she rides a high steed of terrifying proportions. She will drive them before her, away from their work, or on to tasks that are Sisyphean in their nature. It’s best for you to hide from her gaze, and learn what you can from seclusion. As you look about, keep your eyes open for things that seem familiar to you, indicators of a task you may be working on, or have worked on in the past, that is in a state of failure. All your efforts having been brought to naught. All you can do in this time is wait for spring to come, and the return of the Empress Mother. It’s best to note down your thoughts in a tarot journal. Pay special attention to where you’ve missed the signs, or pushed on in spite of evidence that your efforts were hopeless. The lesson of this Major Arcana tarot card in reversed is not knowing when to stop, when to rest, and wait for the right time. This is what you will learn from this meditation.